We cast over 400 episodes of TV’s Forensic Files, Mystery Detectives and Medical Detectives.. Casting for the hit TV shows Forensic Files, Mystery Detectives, and Medical Detectives airing on HLN, tru-TV, TLC and Discovery Life was a demanding project from the start, but LOOK owner Laurie Bianco and her team were up to the challenge. The majority of actors in these shows had to match a very detailed character description, making this casting challenge all the more daunting. Since 2000, LOOK Models and Actors agency has been the preferred casting agency and has cast over 400 episodes. For Laurie and her team, it wasn’t as easy as just pulling headshots from a database – they searched far and wide to find just the right look. Each prospective actor was evaluated by age, height, weight, hair and eye color for every portrayal. And, of course, these characters weren’t always gorgeous models, they needed to represent everyday people with everyday lives. In many cases, these actors even needed to be able to perform physical acts, such as struggling and fighting. Needless to say, the screening protocol was very rigorous, but producers still had to sift through dozens, even hundreds, of potential actors to audition. And on the very rare chance that a match couldn’t be found, Laurie would continue the search. She has been known to stop people in malls and on the street when she spots potential talent. A little unconventional, sure, but for Laurie and her team, it’s all about finding the look. 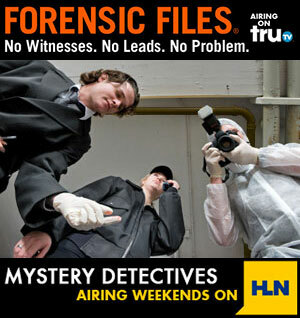 Learn more about Forensic Files and Mystery Detectives. Check out the Forensic Files videos featuring LOOK. Behind the scenes with LOOK as we cast m0re than 400 Forensic Files episodes. How Look cast various pets for episodes of Forensic Files. Look associate Mike Bianco on making “safe” weapons for use in Forensic Files episodes.